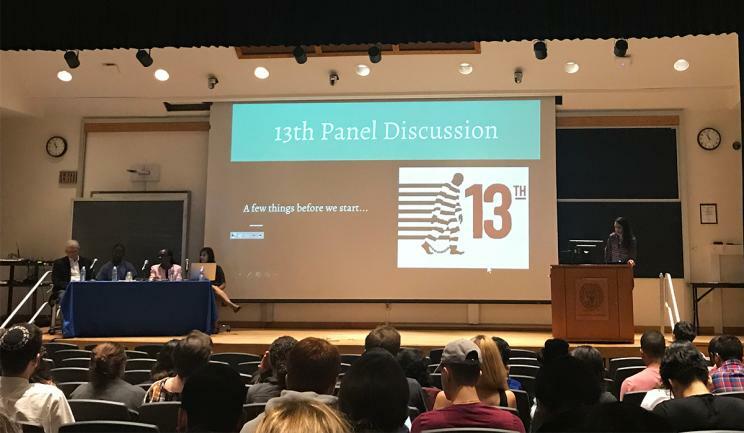 (October 20, 2018) — A hunger simulation facilitated by the Capital Area Food Bank on October 9 gave first-year students at Georgetown University School of Medicine (GUSOM) an opportunity to experience the varied circumstances surrounding food insecurity in Washington, D.C., in an interactive and intimate way. 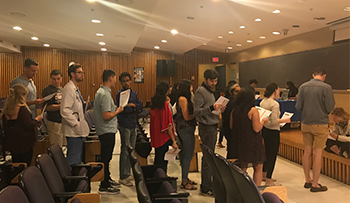 The simulation was part of the Health Disparities and Health Equity intersession, one of two weeklong intercessions that make up the Patients, Population and Policy course. In the hands-on simulation, each student was assigned a budget, a family to feed, and instructions to buy enough food for the day. It also included “stations” such as a benefits office for the Supplemental Nutrition Assistance Program (SNAP), a bank, a station for emergency money and a corner store. Following the simulation, several students commented that they waited in line for most of the simulation without being able to secure any food at all. That experience wasn’t far from the reality for individuals facing food insecurity, the facilitator said. Students wait in line at the station for social services during the Capital Area Food Bank hunger simulation. According to Kureshi, cultivating empathy was one of the goals of the intersession. In addition to the hunger simulation, the intersession included a visit to a pair of exhibits at the National Building Museum: “Evicted,” a collection of images and audio interviews that explore the causes and impacts of eviction, and “Community Policing in the Nation’s Capital,” which looks at urban policing and community participation in Washington, D.C. Students also attended a screening of the documentary “13th,” which examines the prisons system and racial inequality in the U.S.
Panel discussions and small group sessions on race, identity and other social, structural and political determinants of health also made up a large part of the intersession. The “Vulnerable Populations” panel featured patients from LGBTQ, refugee and disability populations as well as individuals who have experienced homelessness. “Their point was to be aware of what your patient may be experiencing, but remember to see the whole person — the human being — first,” he said. How can this experience make medical students better physicians in the future? Dr. Kureshi hopes it will help expand empathy, awareness and an understanding that health is affected by a complex web of external factors. “We can talk to our patients about changing behaviors, but there are all these structures in place that make it hard for them,” she said. This goal appears to be aligned with the student experience. “[The intersession] helped us understand that lack of access or lack of representation can impact health outcomes just as much, if not dramatically more, than the things we see and treat,” said Klein.